How can your love of hobby electronics and your participation in the Canadian National Kayaking Team be combined? Why not use your technical know-how to provide a performance edge? [Geoff Clarke] decided to rig up a paddle for data capture to see if they could learn anything. 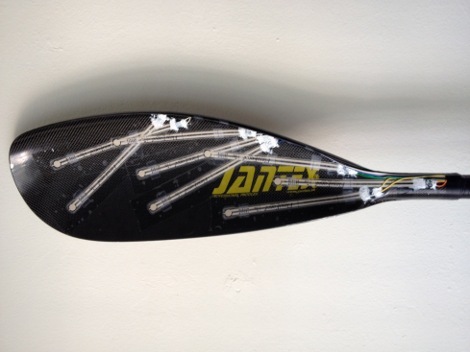 Here you can see that a series of flex sensors were applied to one of the business ends of the paddle. These are connected to a microcontroller which is constantly monitoring them and dumping the data onto an SD card. The design will provide about nine minutes of data before the storage is used up. That sounds like a number that might need improving. We could see this being useful to log a series of practice runs on the same course, but with different athletes. By graphing and comparing the data, you should be able to make observations about how the paddle is being held and when force is applied that could help the rest of the team improve. But we’re way ahead of ourselves. The rig was given a premature test-run and the flex sensors were destroyed by the salt water. We wish this had worked out and hope that [Geoff] will give it another try after rethinking the water proofing. I hate having to pull the “shoulda coulda” card but some stain gauges epoxied or polyurethaned on the surface of the paddle would work better. Those aren’t flex sensors, they’re force sensors, made by “Flexiforce”. They measure the force on the little circular pads at their ends. However, the group is using them correctly; it’s just a mistake on the Hackaday end of things. How about putting the sensors in the paddle, covered in resin? Hey guys, thanks for the post! Even if it worked it would not provide anything meaningful. You will know how hard you paddled, but not how to do it or if it was effective at all. What they need is Mems sensors on the paddle and arms of a person paddling + something to measure speed of the boat against water(so not gps). Add in some Machine Learning magic and you could get a “perfect paddling move”. In fact, we weren’t looking to measure the efficiency of the paddler necessarily. For that we use force sensors, GPS, accelerometers, etc. For the particular project the goal was to see if we noticed significant differences between different blade shapes (because different paddle manufacturers make some pretty radically different blades), and to find the centre of pressure on the blade. Do you really care about the shape and forces? Isnt speed and efficiency more important than some “oh look, this one bends that way” number? Unless you are planning to make your own paddles. rasz you do not seem to be a very bright guy. The paddle is responsible for kinetic energy transfer. Like all systems, there is a loss while transferring that energy. One of the factors is obviously the paddle shape and even it’s attack angle. You could also just record force and moment produced by the paddle during a steady state flow condition and back out the center of pressure right? Definitely a different approach, but coming from an aero wind tunnel background thats where my first thought goes, that or drilling some holes and installing pressure taps if you really want surface pressure measurements. How could you type that with a straight face? Did you seriously not consider that paddle shape and how the paddle bends contributes to efficiency? Speed and efficiency are important too, and are measured using other tests. Distance per stroke, relationships between speed and stroke rate, and the shape of the stroke force curve are all important. Next time waterproof them with silicone conformal spray by mg chemicals. It sounds like you’re looking to locate the center of pressure as close to the centerline of the paddle in order to minimize twisting force for the oarsman to fight. Resulting in less wrist fatique is the theory? Obviously a paddle shaped too much like a golf club is going to exaggerate the amount of force input required as torque. Not my sport so I don’t have much insight to provide on the specific problem beyond silicone being the best damn conformal coat known to man. Build a cheap prototype with RTV compound from Autozone and if you like the data you’re getting, go with the MG Chemicals spray, or the Plasti-Dip brand electrical tape. I wouldn’t waste a lot of time on good coating techniques until you’re happy with the sensor locations. The sprays do tend to cure faster though. Maybe splurge, skip the prototype, and spend the $10 at Mouser or $7 at Harbour Freight. Looks like these sensors are laminated together. Assuming the edges are properly sealed, there is only one point of water entry – the end, where the pins are crimped on and penetrate the plastic; thus breaking what could otherwise be a perfect seal. From there, water will wick its way further inside because the laminate only adheres well to itself, not the rough silver paint. Looking at the closeup of one of the failed sensors, it looks like this is exactly what happened. Silicone isn’t impermeable to water. In fact, permeability of various silicones is typically measured by weight gain after exposure to water. But since you may not have to cover the force-sensing end at all, this opens the possibility of using rigid sealants like like epoxy, which is less permeable. I’ve used a product called Rust Bullet for painting rusty metal. It’s a cyanoacrylate-based paint (like Super Glue), so it’s highly adhesive; and does a great job at preventing additional rust by being highly waterproof. Something like that may work too. Probably other options too, I’m by no means an expert in this area. Have fun experimenting and good luck! Chris, good thinking, I’ll tend to agree with you here. Tekscan says the lamination of the sensors is only “water resistant”, but I have a feeling the crimped pins were the only point of entry. Didn’t realize the silicone wouldn’t be watertight! Instrumenting the paddle is new but a an Australian company has been integrating data logging info into dragon boat paddles, oars and kayak paddles for a while now. The paddles have been seen about the Sydney waterways. They were on ABC(Oz) The New Inventors progr a couple of years ago. Also have a software package to plot metrics etc, a little under an hours with of recording for a kayak I think. Just cover sensors with plastidip. Thats rubber in form of spray paint. I’ve used it today. look at youtube how flexible it is.